When Sand Point Housing resident Charleena Lyles was killed by Seattle Police in June 2017, Solid Ground had no reliable way to instantly alert all 400+ campus residents about the emergency. Recently, a volunteer crew from Seattle GiveCamp took major strides to make sure that residents can be alerted quickly and reliably if there are future emergencies on campus. GiveCamp is a nonprofit that provides pro bono software development to Seattle-area nonprofits. They host weekend-long “hackathons” that bring together programmers, designers and other software professionals to create web, desktop and mobile software for nonprofit organizations. From October 26 to 28 at the Microsoft Commons, a team of volunteers worked to complete the prototype emergency messaging system initially developed by Solid Ground’s Data Systems Developer, Joseph Boland, in close communication with our Sand Point Housing team. Sand Point Messaging will enable Solid Ground staff to quickly communicate critical information to residents via text message in the event of emergencies. This will help quell rumors while providing constructive and even life-saving guidance. GiveCamp volunteers Maxwell Rediker and Xuan Wang took the prototype and turned it into a reliable and easy-to-use solution. The app uses SharePoint lists, PowerApps forms, and a Microsoft Flow workflow that sends messages through Twilio’s programmable SMS component. Through the weekend-long build, the team worked through conditional pathways and added all the error handling and logging steps. They received invaluable expert assistance from Tyrel Hunter, one of the few people present with professional experience with Flow. At the end of the weekend, we had a new app that will support our Sand Point Team to communicate in emergencies. Solid Ground is thankful to Maxwell, Xuan and Tyrel, without whom this app might never have been finished. We are also grateful to Paul Litwin, Suzanna Litwin, Josh Holmes and all the others who make GiveCamp possible. 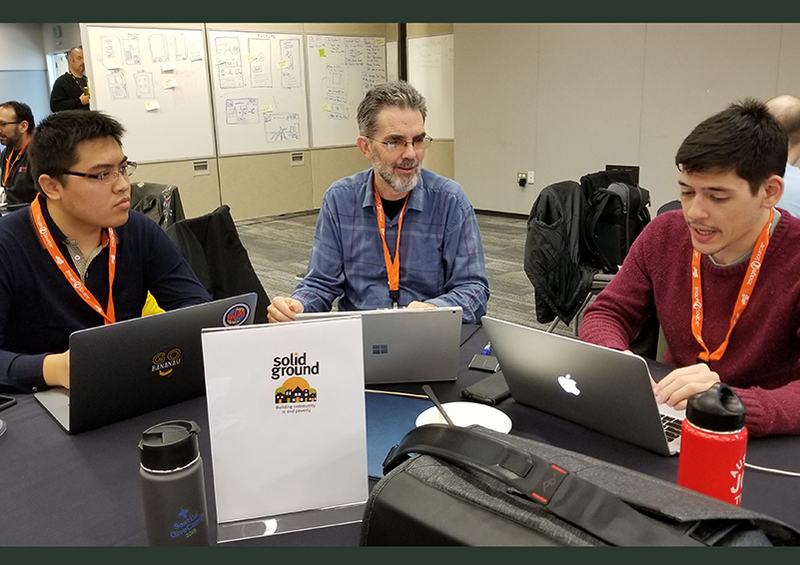 Featured image at top: GiveCamp volunteers Xuan Wang (l) and Maxwell Rediker (r) work with Solid Ground’s Joseph Boland (c) to develop a custom emergency communications app for our residential housing programs. Language interpretation & reasonable accommodations for disabilities made on request. Content on this site reflects the thoughts/opinions of the writers, not necessarily Solid Ground.